A birthmark is a congenital, benign Pigmentation/Blemish on the skin which may be present at birth or may appear shortly after birth. These can occur on any part of the skin. While some birthmarks are small and inconspicuous, others have a more prominent appearance, which can be bothersome to some and can even lower their self-esteem. In some cases, certain types of birthmarks can become a health risk. Some birthmarks like hemangioma fade or disappear over time, however, all the other types will never fade or go away. Birthmark removal/reduction offers a solution to people who are self-conscious about their appearance and even help reduce the possibility of health risks associated with the certain nevus. Vascular birthmarks, such as hemangiomas, macular stains, or port wine stains, are the result of the presence of an abnormal number of blood vessels. Pigmented birthmarks such as moles, nevus café au lait marks or nevus of Ota are the result of pigmentation inconsistencies. It is advisable that any newly born infant with a birthmark gets completely checked and examined by the doctors as some birthmarks may be associated with other underlying defects. 1) Some vascular birthmarks such as Hemangioma may disappear or decrease with age and may not cause any problem. Strawberry hemangiomas subside with age. However, if any hemangioma is associated with an important anatomical structure such as the area around the eye or mouth, and cause feeding difficulties, pressure symptoms, loss of vision, the birthmark will be required to be removed. This treatment could include vascular specific Laser Treatment. 2) Certain birthmarks may require treatment only for cosmetic reasons. For example, large congenital melanocytic nevi, nevus of Ota, port wine stains lead to cosmetic disfigurement. 4) A customized single wavelength laser light wave that is suitable for the particular coloration of the birthmark, is used at a specific frequency. during several treatment sessions, the laser breaks down the coloration of the mark so that it fades away and blends in with the surrounding skin, without leaving any residual scars behind. But in many cases, the mark may not vanish completely. 5) Laser treatment is the gold standard for the treatment of Birthmarks, however, surgery can also be used for the treatment purpose in some rare cases where laser treatment is ineffective if excision (surgical removal) and grafting are needed. 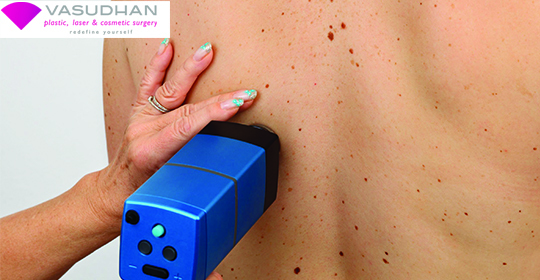 The purpose of the treatment is to diminish or remove the marks for medical or aesthetic reasons. After the treatment, the affected region of skin should be kept away from sunlight and UV rays. Sunscreen should be used when the laser treatment is going on. Multiple sessions ranging from 4-10 may be required based on the type of mark treated. Vascular marks may swell up, and get pigmented after being treated with laser. Similarly, pigmented marks can temporarily become darker, or whitish after the laser treatment with some associated pain post procedure. Nevus of Ota and port wine stain has shown some of the best outcomes when being treated with lasers. At times, marks may fade away to a considerable amount, and ghost images may still remain behind. These ghost images may be concealed using cosmetic makeup, or sometimes repetitive sessions of laser treatment may be required. Can nevus/ birthmarks can be removed from eyelid at the age of 5 yrs. this is such a good article on birthmark. Thanks for mentioning that Nevus of Ota and port wine birthmarks have some of the best outcomes after being treated with lasers. My sister recently had a daughter who has a port wine birthmark. I’ll pass along the info you shared and let her know she can expect good results with laser treatment!